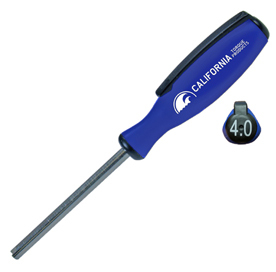 CTP-8SDP-1004 is an industrial grade preset click type torque driver designed for the tire industry. Designed for the removal and installation of tires valve core, the torque limiting feature prevents the valve stem from being over torqued. It conveniently locks in the counterclockwise direction for easy core removal. It is preset to 4 In-Lbs (.45 Nm). The driver can be used on 95% of current model tire valve stem cores. The ergonomically designed 3 sided handle provides a comfortable non-slip grip for better hand control while wearing gloves, with wet, or oily fingers. The molded polymer handle also features a convenient pocket clip for easy accessibility.